Posted March 29th, 2019 by basementmovies & filed under Watch. Have ye heard the news? Larry Kinkaid’s been shot and his cattle have done been rustled! 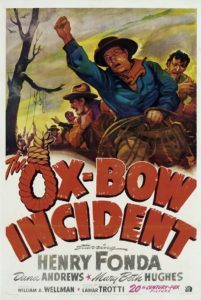 Meet us down by the Ox-Bow for some frontier justice and moral ambiguity. In Seen It, we talk westerns: featuring Butch, Sundance, Clint, Marshal Kane, and Buster. Raindrops Keep Falling On My Head is a Burt Bacharach and Hal David song.